The U.S. DoE official in charge of natural gas testified to FERC’s oversight committee that fracking provides “unprecedented opportunities” for profit through LNG export. She, like FERC, says the opportunities are “for the United States”, and they’re both wrong. Pipelines to LNG export that would raise domestic natural gas prices and take local land and pollute local air and water is not for the U.S.: they’re for profit by a few fossil fuel companies and utilities. Landowners and taxpayers should resist this invasion of our country by profiteering companies. That’s global freedom for fossil fuel companies to profit by exporting to all 159 WTO member countries, including China and Ukraine, and domestic prosperity as in domestic natural gas prices would go up (don’t believe me; listen to T. Boone Pickens), while local landowners face eminent domain to take their property, destroy their fields, forests, and wetlands, and risk their air, water, and lives. I don’t think that word “prosperity” means what Ms. Gant thinks it means. Here’s a Food and Water Watch petition against H.R. 6. And since the Senate has made no move to pass H.R. 6, the House has also passed H.R. 3301 to remove almost all permitting on pipelines to Mexico and Canada. Canada, where for example Spectra’s Algonquin and Maritimes pipelines go to Nova Scotia where an LNG export terminal is proposed, as part of what Bertrand Marotte called in The Globe and Mail of Toronto, In race to export LNG, a new Atlantic plan. Funny how Ms. Gant didn’t mention any of that. Hey, TPP would only add 11 more LNG export countries, far fewer than H.R. 6, but among them would be Vietnam, Japan, and likely China would join in. And then there’s the other secretively-negotiated pending treaty, the Transatlantic Trade and Investment Partnership (TTIP) aka Transatlantic Free Trade Area (TAFTA), which would add all 28 EU member countries. Apparently any avenue for LNG export profits is good enough for the fossil fuel industry and its regulatory-captured elected and appointed officials. Why is all this being proposed, Ms. Gant? Video found by Bill Huston; see separate post. The boom in domestic shale gas provides unprecedented opportunities for the United States. Over the last several years, domestic natural gas production has increased significantly, outpacing consumption growth, resulting in declining natural gas and LNG imports. Production growth is primarily due to the development of improved drilling technologies, including the ability to produce natural gas trapped in shale gas geologic formations. Historically, the DOE has played an important role in the development of technologies that have enabled the United States to expand development of our energy resources. Between 1978 and 1992, public research investments managed by the Department contributed to the development of hydraulic fracturing and extended horizontal lateral drilling technologies that spurred private sector investments and industry innovation, unlocking billions of dollars in economic activity associated with shale gas. 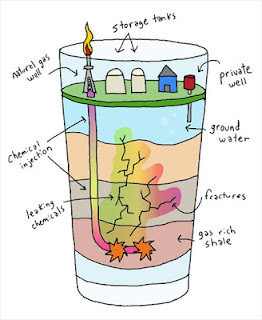 Everybody else calls that fracking, and Ms. Gant not only couldn’t bring herself to use that word, she didn’t mention how fracking destroys people’s land and wildlife habitat while poisoning water sources and leaking methane into the air from wells and pipelines; methane that is 20 times worse than CO2 for climate change, according to the EPA. The committee has been actively engaged on the benefits of liquefied natural gas (LNG) exports and is taking action to ensure the benefits can be realized. After a series of hearings and an international forum, the committee issued a report detailing the economic and geopolitical benefits of U.S. LNG exports. Now, the committee is taking action to ensure the U.S. does not miss out on this window of opportunity to boost our economy and help our global allies. That Committee goes on to push H.R. 6 on the same web page. Today, domestic natural gas prices are lower than international prices of delivered LNG to overseas markets. As in the United States, demand for natural gas is growing rapidly in foreign markets. Due primarily to these developments, DOE has received a growing number of applications to export domestically produced natural gas to overseas markets in the form of LNG. Here’s FE’s instructions on how to apply for LNG export. Here’s FE’s current list of applications. Section 3(a) thus creates a rebuttable presumption that a proposed export of natural gas is in the public interest. Section 3(a) also authorizes DOE to attach terms or conditions to orders that authorizing natural gas exports the Secretary finds are necessary or appropriate to protect the public interest. Under this provision, DOE performs a thorough public interest analysis before acting. Remember, according to FERC’s own rules, if a pipeline company can establish a need and a public benefit that outweighs any downsides such as environmental destruction, they can approve a pipeline permit. So Ms. Gant is setting the stage for public need or “public interest” as the NGA calls it, to be presumed without any proof. So if Ms. Gant’s interpretation of the NGA is accepted, FERC is more than halfway to a permit. A permit that gives the pipeline company power of eminent domain to take your property for a pipeline to LNG export terminals. This is why it’s important that Spectra’s Andrea Grover has admitted recently, for example to the VDT, that Sabal Trail has not proven need. We can’t depend on FERC or FE to stop this pipeline without massive public pressure, including from well-known public figures and from Congress. Here’s FE’s list of Long Term Applications Received by DOE/FE to Export Domestically Produced LNG from the Lower-48 States (as of July 9, 2014). One of those FE-approved LNG export operations is Cove Point, Maryland, which provoked that July 13th massive rally with arrests in front of FERC. Two others Jordan Cove and Oregon LNG, are in Oregon, connect through Williams Company’s Washington Expansion Project (WEP) pipeline to Spectra’s BC Western Pipeline, and are opposed by Columbia Riverkeeper, Rogue Riverkeper, and Sierra Club. Southern LNG is Elba Island, GA, now applying to change from LNG import to LNG export, which could easily connect to Spectra’s Sabal Trail pipeline through existing pipelines in Georgia, or should we watch to see when a pipeline is proposed from Spectra’s Albany compressor station through Tifton and Fitzgerald to Elba Island? Gulf Restoration Network is already opposed to Spectra’s Sabal Trail pipeline, and tying in all these other LNG export operations could help increase their opposition. The Office of Fossil Energy has already approved three LNG export operations from Florida. And keep watching Port Dolphin near Tampa to see when it files for export, like Elba Island, Georgia, already did. Let’s not forget that FERC also can and does approve LNG export applications; here’s FERC’s own web page on that. Among FERC LNG export applications is one by Southern LNG Company for Elba Island Georgia, so I guess it’s a race to see whether FERC or FE approve that one first. Or maybe both should reject it. DOE and FERC/MARAD have independent review processes. DOE’s approval of the export commodity, and FERC/MARAD’s approval of the export facility, are both generally required for LNG exports. MARAD is the U.S. Department of Transportation Maritime Administration, with its Deepwater Port Licensing Program. For example Excelerate has filed with MARAD to renew its license for its deepwater LNG port off of Boston Harbor. A permit that does not appear to exclude LNG export. For a port that could be fed by Spectra’s Algonquin pipeline. Spectra’s LNG export plots don’t even stop with the U.S. Spectra’s pipeline in British Columbia that farmers are suing not only goes to an LNG export terminal in BC, but also could feed those Oregon LNG export terminals. As mentioned, Spectra’s Algonquin and Maritimes pipelines lead straight to the proposed Goldboro LNG export terminal in Nova Scotia. Thank you, Ms. Gant, for spelling out the fossil fuel company LNG export profit motive at the heart of the pipeline eminent domain boondoggle. As a species I sometimes wonder if we most resemble the ostrich. If we duck our heads, ignore the problem for long enough, it will just, maybe, hopefully, please, go away. Or perhaps our approach is more like Bill Clinton’s solution to gays in the military – don’t ask, don’t tell! After all, if nobody talks about it, it isn’t there, is it? It’s hardly unlikely that for some inexplicable reason, I am the only guy who has these conversations. It is more likely that most of us see the truth for what it is. We are gradually, speeding up, speeding up, speeding up, destroying the very planet that gives us life. Suicide or madness? Take your pick, I can’t figure it out. I wonder who our political leaders talk to? Do they have these conversations or are they shielded for their own protection? They don’t appear to be losing much sleep about it all as the oil companies drill away, as the auto manufacturers continue to turn out the gas combustion engine, as poisons are released into our rivers, lakes, oceans, landfills – anywhere the millions upon millions of barrels of poisonous waste can be hidden for awhile. Long enough, they hope, to finish making the money, packing up and leaving the deadly stuff behind. Perhaps, like Chernoble, the animals will have another paradise, free of humans, in a future that may be as inevitable as the prediction of my house painter friend – a hundred years or so.